Survey respondents in Ireland indicated that 46% of B2B sales in Ireland were transacted on credit terms. This percentage, which is more or less in line with the regional average of 41.3%, highlights Ireland’s credit-friendly business environment. After Denmark (69%), Greece (56%) and Sweden (56%), Ireland has the highest average of the countries surveyed in Western Europe. However, the 2016 share of sales on credit terms is below the 2015 level (52%), when the proportion of sales made on credit terms in Ireland registered a notable upswing. Consistent with the averages of Western Europe (45% domestic and 38% foreign),the total value of domestic sales (47%) on credit terms in Ireland is slightly higher than that of foreign sales (44%). 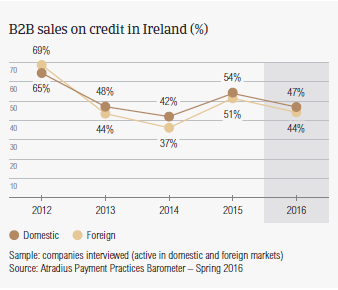 This means that Irish respondents share the perception that foreign sales on credit terms may be riskier than domestic ones. Consistent with the survey average, nearly 90% of Irish respondents experienced late payment of invoices by B2B customers in 2015. About 42% of these are B2B receivables which remained outstanding past due. Late payment of invoices occurred more often with domestic (46%) than with foreign customers (37%), and increased compared to 2015 levels. Late payment of invoices (domestic and foreign) is reflected in the Days Sales Outstanding (DSO) figure posted by Irish respondents. The 2016 average DSO figure is 52 days, which is two days shorter than in 2015 and slightly above the regional average. The relatively high DSO level indicates that Irish respondents may still experience difficulty in collecting long outstanding invoices. 54% of Irish respondents do not expect any changes in the DSO level over the coming 12 months. The strong effort to manage receivables portfolios more efficiently to improve business profitability, evidenced by survey respondents in Ireland, may explain why 24% of the respondents in the country compared to 16% in Western Europe, reported that maintaining an adequate cash flow is one of the biggest challenges they will be facing in 2016. The average payment term set by Irish respondents for B2B customers averages 29 days from the invoice date, and is not markedly below the survey average (31 days). Domestic and foreign terms differ by only two days, reflecting the already mentioned uniform perception of payment risk arising from both domestic and foreign B2B trade. Over the past year, payment terms did not vary markedly, which highlights a consistent payment culture in the country. This payment delay does not show marked differences when compared to 2015. With an average of 43 days from invoicing to turn past due receivables into cash, the average for Ireland is 10 days shorter than the average of Western Europe overall. A slightly higher percentage respondents in Ireland (50%) than in Western Europe (48.5%) reported customers’ liquidity issues as the main reason for late payment of domestic and foreign B2B invoices. The percentage of Irish respondents reporting this reason has slightly decreased this year (62.5%) compared to 2015 (64.7%). 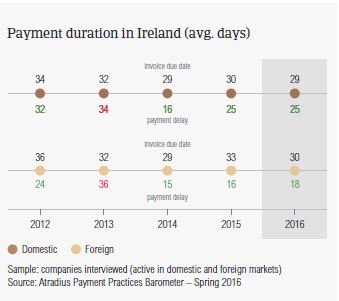 In contrast, more respondents (37%) this year compared to 33% in 2015 reported this payment delay factor in respect to foreign invoices. 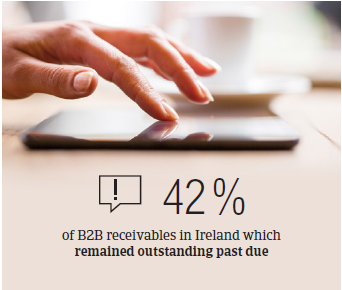 In line with the survey average, about 25% of Irish respondents customers’ intentional use of outstanding invoices for financial advantage was the second most often cited reason for late payment of B2B invoices. Respondents in Ireland believe this occurs more often with domestic than with foreign payments. Late payment by foreign customers is also reported to frequently occur due to complexity of the payment procedure (30.0% of respondents in Ireland versus 28% in Western Europe). 39% of respondents in Ireland said that payment delays did not have a significant impact on their businesses. At the same time, 27% reported the need to postpone payments to their own suppliers and 26% that they needed to take specific measures to correct cash flow. These findings indicate a persistently challenging business environment and a possible need to increase credit management techniques. To address these issues, around 40% of respondents said they will check their customers’ payment records and increase monitoring of their buyers’ credit risk. 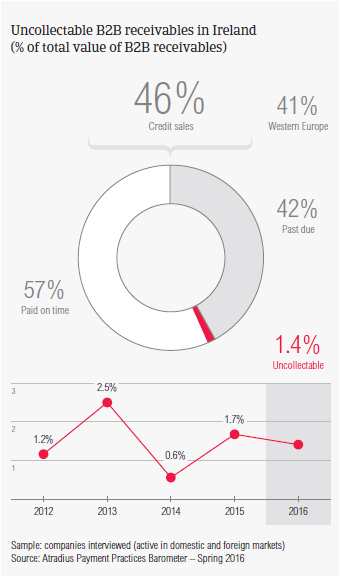 The proportion of B2B receivables reported by Irish respondents as uncollectable (1.4%) is consistent with the 1.3% average for Western Europe. Domestic uncollectable receivables were written off almost as often as foreign ones. Uncollectable B2B receivables originate most often from the construction, consumer durables, financial services, food, services and business services industries. For more respondents in Western Europe (59.3%) than in Ireland (44%), B2B receivables were uncollectable because the customer went bankrupt or out of business. At the same time, more Irish respondents (36%) than respondents in Western Europe overall (29%) reported that write-offs were mainly due to failure of collection attempts. 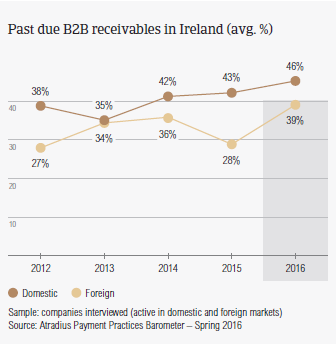 More respondents in Ireland (32%) than in Western Europe (21%) reported that B2B receivables were written off mostly because the debts were too old. Survey respondents in Ireland reported granting trade credit terms mainly to B2B customers in the consumer durables, construction, business services and overall services industries. Invoice payment terms extended to B2B customers in these industries are in line with the country average of 29 days. Customers in the consumer durables sector settle their past due payments the quickest (49 days), while those in the services industry take the longest (62 days). 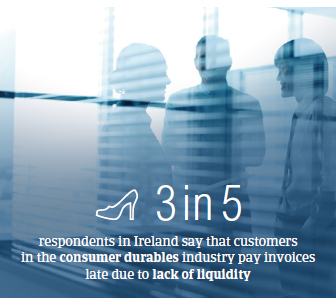 More than half of the respondents in Ireland (58%) said that payment delays in the consumer durables sector are most likely to occur due to a lack of liquidity of customers. The second most cited reason for payment delays is the buyers’ use of outstanding invoices for their financial advantage, as reported by 42% of respondents. Over the next 12 months, most of the Irish respondents expect no changes in the payment behaviour of B2B customers in all the industries they mainly trade with. At the same time, around 38% of respondents expect a slight improvement mainly in the construction, business services and services sectors. In 2015, Ireland’s economy is forecast to grow by 3.6%, backed by exports to the US and UK where demand is picking up. Private consumption is expected to increase further.